This shadow blue frost fox throw is handmade in our workshop in Kiel, Germany by our skilled team of expert furriers and tailors. The shadow blue frost foxes from this item come from the Scandanavia. 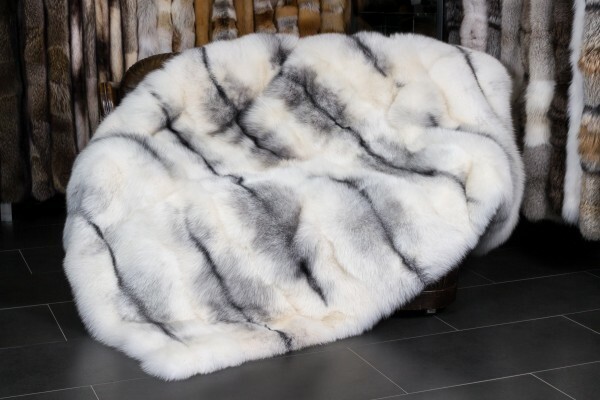 These furs come with the Origin Assured industry designation, which guarantees that all of the fox furs used in the creation of this product are of the highest quality. We would gladly create this blue fox blanket in any custom size you'd like. Please note, however, that this would lengthen the time of delivery ca. 2-3 weeks. Related links to "Shadow Blue Frost Fox Throw - SAGA Furs"
Customer reviews for "Shadow Blue Frost Fox Throw - SAGA Furs"
Happy with this purchase, especially that the cold weather is coming in. The fox throw is perfect for those chilly nights. It's soft material and big enough to snuggle up my wife and two little girls. Shipping to the UK was easy and fast.